Current practice in the creation of a sleeve gastrectomy involves the use of a bougie or endoscope of known diameter around which the sleeve is stapled. We conducted a case study to evaluate the size of the sleeve that is actually created, to see whether it approximates the size of bougie used. We also sought to assess how much a sleeve, created during a sleeve gastrectomy, stretches as it is filled. Using three pig stomachs, three sleeves were created using Covidien (Dublin, Ireland) EndoGIA Universal stapler with Green staple loads. The sleeves were created with calibrated 30F, 40F and 50F bougies. The average diameter of the sleeve proximal to the pre-pyloric pouch was measured with an EndoFLIP EF-620 catheter (Crospon, Galway, Ireland). Using a solid state pressure transducer located within the EndoFLIP catheter balloon, the balloon was filled with a diluted saline solution to obtain two distending pressures of 4mmHg and 28mmHg. These pressures correspond to the resting sleeve pressure and the pressure of a full sleeve as reported in (Yehoshua et al. : Obes Surg 2008 18:1083-1088). 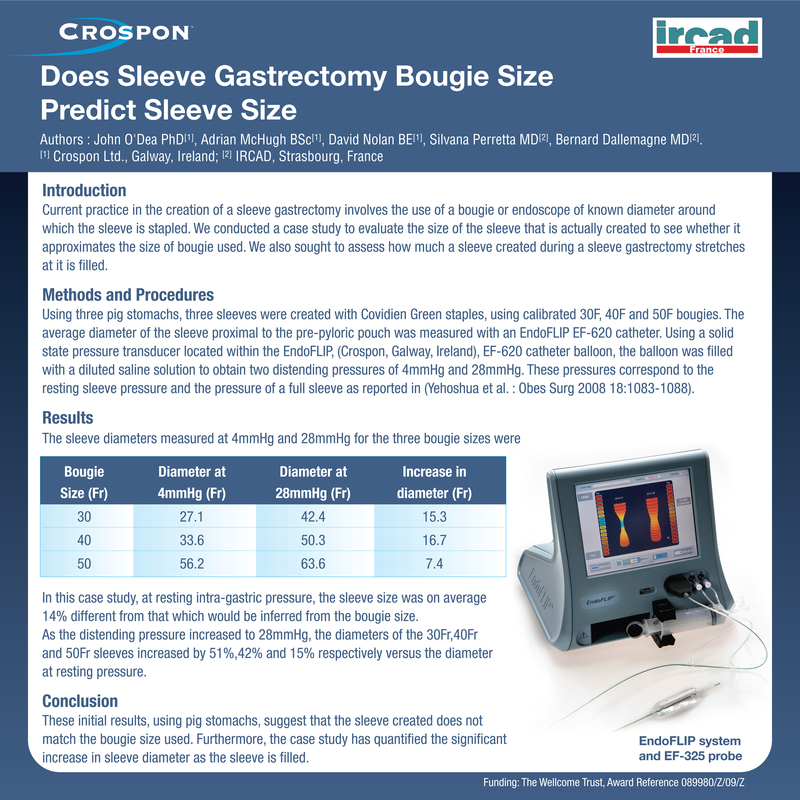 In this case study, at resting intra-gastric pressure, the sleeve size was on average 14% different from that which would be inferred from the bougie size. As the distending pressure increased to 28mmHg, the diameters of the 30Fr,40Fr and 50Fr sleeves increased by 51%,42% and 15% respectively versus the diameter at resting pressure. These initial results, using pig stomachs, suggest that the sleeve created does not match the bougie size used. Furthermore, the case study has quantified the significant increase in sleeve diameter as the sleeve is filled.